It was a sweltering 39 degrees in Manila yesterday! I’m not complaining – I’ll take sunshine over rain any day. 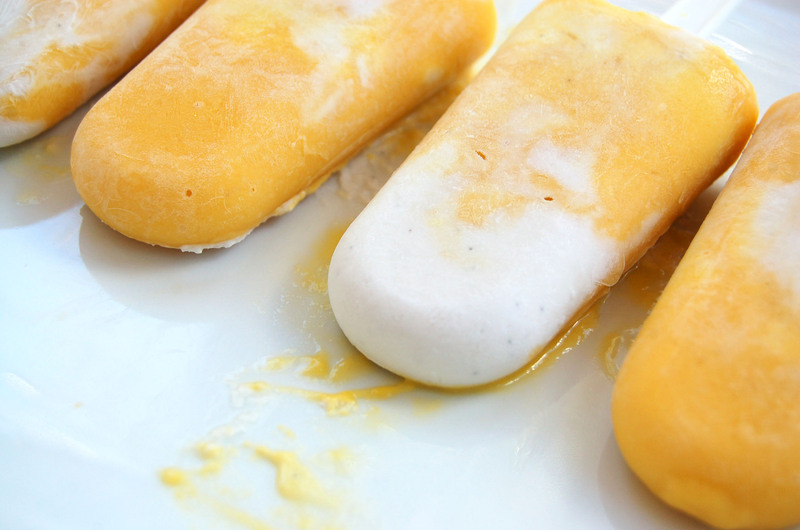 Perfect weather for these dairy & and refined sugar free popsicles! I’m so glad to finally share this recipe with you – it’s one of my favourite desserts to date. Hope you enjoy them as much as much as I did, they’re a great a treat for both kids and adults alike! For me, mangoes are ideal for desserts as they’re so naturally sweet that they barely require any sweetener. This recipe makes 6 popsicles, so there’s only 1/2 a TEAspoon of maple syrup in each one – that’s it! I think I’ll be making a strawberry version next. What would you recommend? Open the can of coconut cream left in the fridge overnight. Gently scoop out the solidified cream and discard the left over water. This should make about 1 cup of cream. 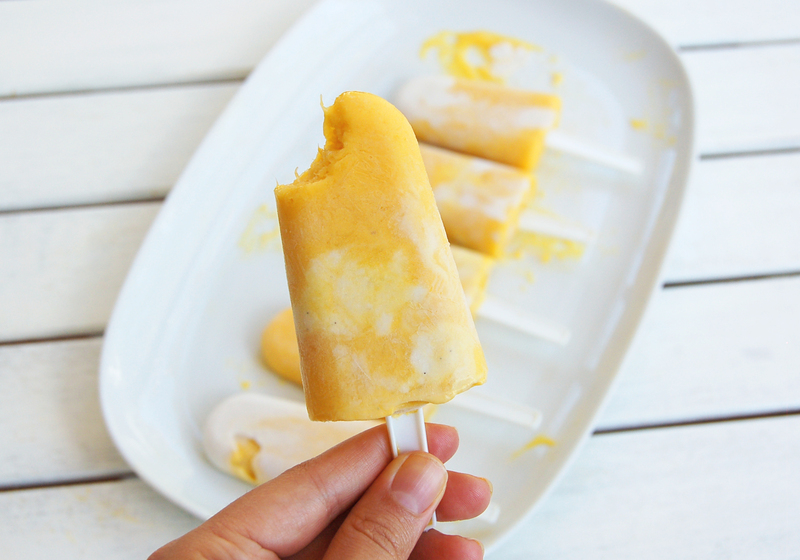 Scoop out the flesh from the mango and puree with 1 teaspoon of maple syrup and half a cup of the coconut cream. Set aside. Mix 2 teaspoons of maple syrup with the other half of the coconut cream, as well as the vanilla bean paste. Puree or blend in a food processor. 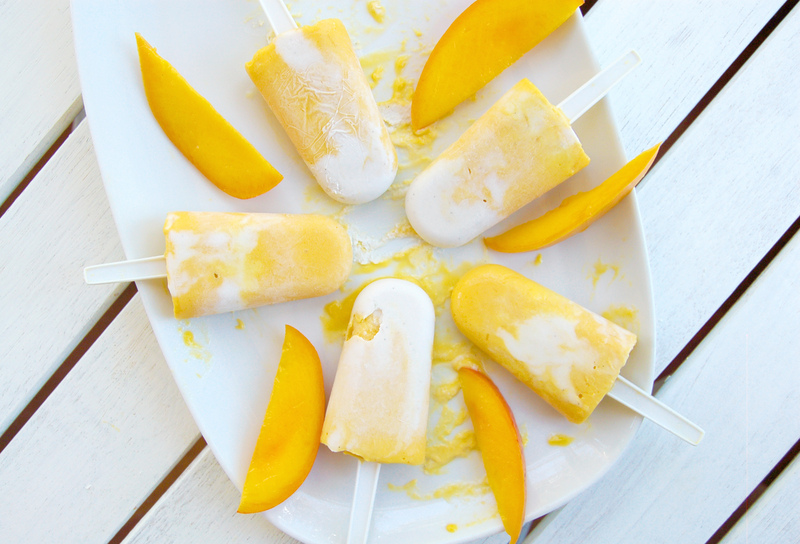 To create the marbled effect in the popsicles, fill the moulds in alternate layers of mango and coconut. I ran a chopstick down the inside of the moulds to create some extra swirls. Can I use vanilla extract instead of vanilla bean paste? Yes that sounds like a good idea! Maybe next time! Crème de coco?? Est-ce la meme chose que du lait de coco? Coconut cream is coconut milk?